Read about upcoming scheduled maintenance and upgrades to the UC Learning Center software platform. The latest upgrade to the UC Learning Center was on Friday, July 20, 2018. Please see the Benefits section below for more information about the upgrade. There are currently no scheduled maintenance updates. 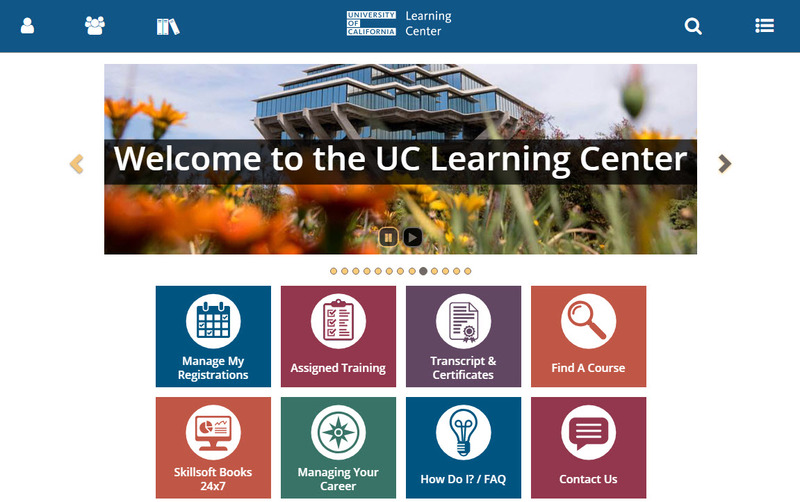 The UC Learning Center was recently updated to version 18.2! Log in to the UC Learning Center at https://uclearning.ucsd.edu using your Single Sign-On credentials to access the enhanced platform. While the interface and navigation of the upgraded UC Learning Center remains the same, there are some enhanced features. The resources listed below will help to navigate UC Learning. My due date for an assigned training will occur during the upgrade. What should I do? The UC Learning Center will be accessible on July 21, 2018. At that time, you will be able to log in to complete your assigned trainings. If you have any further questions regarding your overdue trainings, contact us via ASK (login required). I receive subscription reports from the LMS. Will they still be available? Training history/compliance reports will not be available during the upgrade. Subscription reports will resume on their typical schedule on Saturday, July 21, 2018. If you have report-related questions, contact us via ASK (login required). I have questions about the upgrade. Who can I talk to you? You can contact the UC Learning Center support team at ASK (login required).